features, the Deltek 180 exemplifies the DELTEK DIFFERENCE. From the unique, virtually indestructible triangular design and sealed polycarbonate lens, to its superior, long lasting LED illumination and ultra low current draw, 180® LED Warning Beacons offer outstanding lighting performance and maximum durability for a vast range of applications where highly directional optical warning signals are required. Utilizing a high-intensity LED lighting system incorporated into a triangular, solid-state circuit board, 180® beacons produce high intensity, axially symmetrical cones of light to both front and rear of the machine ensuring high visibility along the axis of travel, whilst a low intensity beam to either side effectively reduces dangerous glare to machine operators caused by light reflecting from adjacent structures or the warning beacon itself. 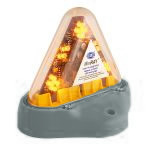 180® beacons have been specifically designed to protect machinery operating underground or in other areas where both machine type (identified by LED color) and direction of travel are essential indicators to identify potential dangers. 180® beacons produce different light source patterns to the front and rear of the vehicle identifying the direction of travel and effectively reducing the risk of collisions in poor visibility conditions. In addition, 180® beacons provide 3 user-selectable power levels to suit specific mine requirements along with a selection of flash patterns, which can be linked to the operating mode of the machinery, making changes in equipment travel direction highly visible. Each 180® beacon is resistant to prolonged vehicle vibration and sealed against damaging ingress of moisture and dust for increased durability and long service life. The unique triangular design deflects direct impact and reliably protects against damage caused by falling rocks, vehicles, hand tools or construction debris, whilst rounded corners minimize the risk of personal injury when working in confined spaces. 180® LED beacons require only very little power, which allows them to operate day and night, even when the machinery is turned off. And when they do run off truck batteries or other field equipment, they will operate for days without draining the battery cells, making them a cost-effective and reliable lighting solution for any type machinery from large earth moving vehicles to smaller equipment such as welders, generators and compressors. And, unlike Xenon flash tubes, LEDs produce very little radio interference and light pulses that do not disturb laser-testing equipment. 180® LED beacons are available in 5 different function colors (amber, red, green, blue and white) and offer a variety of mounting options to suit every installation requirement including direct mount, magnetic base, battery box (self-powered) and magnetic battery box (self-powered).